You are here: Home » MEDIA » Books » Echoes (The Epherium Chronicles book 3) by T.D. Wilson (book review). Echoes (The Epherium Chronicles book 3) by T.D. Wilson (book review). Battle stations! 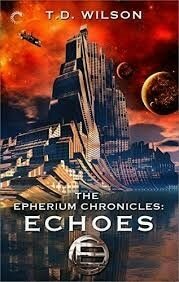 ‘Echoes’, the third book of ‘The Epherium Chronicles’ by T.D. Wilson, begins and ends with conflict. Lester Styles, captain of the EDF Cestus, is in charge of the supply train headed for Cygni. He has one jump left to make and one ship reporting a problem with their space-fold drive. Appointing the Cestus rearguard, he waits for the entire train to make the jump before following. The Cestus never makes the jump. When Captain James Hood investigates, he finds nothing but wreckage and a few survivors. The purpose and perpetrator of the attack are a mystery, but Hood has his suspicions and more problems than stars on his chart. The peace he brokered with the Cilik’ti is under threat and the Cilik’ti Ambassador, Kree, is keeping a dangerous secret. The colonists at Tau Ceti are struggling to maintain a foothold, battling the native fauna and an inexplicable side effect of the Embrace technology they used during the twenty-five year voyage. Fighter pilots are brawling aboard the Armstrong and someone else is bent on sabotage. Skirmishes flare across the galaxy. The targets seem random but, as each threat is investigated, evidence continues to point to the ship that shouldn’t be, the one that followed the Armstrong’s voyage to Cygni. As if all this isn’t enough to keep the reader flipping pages, Maya Greywalker’s story shifts from the sidelines here, showing that her inclusion on this mission is probably more than coincidental. The pace of ‘Echoes’ far outstrips the previous two books in this series. There is so much going on, it’s difficult to take a pause and I ended up reading the second half of the book in one sitting. Every page revealed new evidence and a new twist, another problem Hood and his crew had to solve. There is combat and conflict, small scale and large. Space battles and more time with the fantastic MACE-equipped marines. More people to keep track of, but Wilson has done such a good job of cementing the places of the initial characters that the few additions walk in seamlessly. I enjoyed the time spent with Rafael Sanchez and Maya Greywalker in this novel. We get to see them training together again and building something more than a friendship. These are two of my favourite characters in the books. Sanchez for his personality and Maya for her back story. We didn’t get as much time with Hood, but that’s probably a good thing. He’s a busy guy and best left to doing what he does best, leading the mission. He faces new challenges this book, though, which keeps the entire story fresh. In fact, everyone faces challenges in ‘Echoes’. Every character is tested in some way. We’re at the mid-point of the series, so this is timely and a few words exchanged with author T.D. Wilson indicated that this is fully his intent with this novel, to see what his characters are made of. Where to from here? To the third colony, I hope. So far, Cygni seems like a winner, but Tau Ceti may still be viable. What problems will the colonists of the third mission face? War is brewing, if not already declared, and saboteurs are roaming the galaxy, agenda undefined and Kree has a mission of his own, which could have a bearing on the outcome of many, many things. Echoes by Laura Tisdall (book review). « Metal Gear Solid by Raymond Benson (book review).